Custom bandanas make bang on target promotional gifts and delightful personal gifts to celebrate the lighter side of life! These high impact and low cost personalized bandanas are perfect to promote cafes, fast food counters, health clubs and apparels. 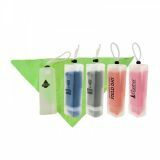 These can be also used for mass promotions like trade shows and outdoor summer sales. Choose from a range of fabrics and color choices at ProImprint and stretch out your brand along its vast imprint area to grab attention. Shop today and get proofs and art work assistance for FREE on your order! Promotional logo imprinted bandanas are versatile and stylish accessories that impart a fairy tale charm to even a low key promotional campaign. Use it indoors or outdoors as a towel, headgear or around your neck. It can even be used for the pets, hence bandana makes a perfect fit for a range of roles! People will love to sport these bright colored accessories that will drive up their personal style by a few notches. 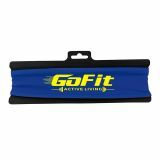 Add your own text or brand logo on the massive imprint space to drive up your promotional campaign. Choose from a range of options including solid colors, traditional paisley print or full imprint designs to make it your personal canvas for all your creative branding needs. Bandanas can be used as head or wrist wraps or cowboy-style neck scarves to add specks of color to the attire. Custom bandanas are unique promotional giveaways topped off with fun. 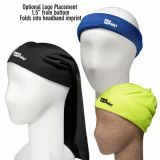 The wide imprint area makes these bandanas walking billboards for your brand. Every time your customers wear it, they will be flaunting your brand logo. Promotional bandanas are available in a range of fabric choices including cotton, silk and polyester among others. Long lasting and low on maintenance, bandanas make exceptional style statements that ensure an instant make over. Order your favorite bandanas at ProImprint and set off a promotional campaign that will never lose steam. 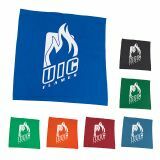 Logo imprinted custom bandanas offer a fun element and excitement to your marketing campaign, which in turn will attract new customers and keep the existing ones happy. After all, who doesn’t want to be part of an exciting and fun filled branding campaign, where the customers need not do anything other than look good in a stunning bandana? Customized bandanas are good options for sports sponsorships, athlete meet and marathons and it makes an impressive spectacle at a rally when people turn up in large numbers sporting your brand imprinted bandanas in different striking colors. There is something special for everyone in personalized bandanas that choosing the one that suits your visual appeal and brand identity at ProImprint is a breeze. If you need selection or design help, just call us at 844-776-4677 or email us at info@proimprint.com as our friendly staff is always by your side.